We model the internal structure of the Moon, initially homogeneous and later differentiated due to partial melting. 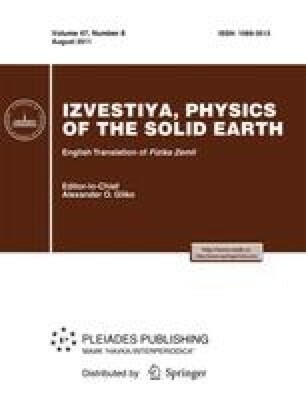 The chemical composition and the internal structure of the Moon are retrieved by the Monte-Carlo inversion of the gravity (the mass and the moment of inertia), seismic (compressional and shear velocities), and petrological (balance equations) data. For the computation of phase equilibrium relations and physical properties, we have used a method of minimization of the Gibbs free energy combined with a Mie-Gr@uneisen equation of state within the CaO-FeO-MgO-Al2O3-SiO2 system. The lunar models with a different degree of constraints on the solution are considered. For all models, the geophysically and geochemically permissible ranges of seismic velocities and concentrations in three mantle zones and the sizes of Fe-10%S core are estimated. The lunar mantle is chemically stratified; different mantle zones, where orthopyroxene is the dominant phase, have different concentrations of FeO, Al2O3, and CaO. The silicate portion of the Moon (crust + mantle) may contain 3.5–5.5% Al2O3 and 10.5–12.5% FeO. The chemical boundary between the middle and the lower mantle lies at a depth of 620–750 km. The lunar models with and without a chemical boundary at a depth of 250–300 km are both possible. The main parameters of the crust, the mantle, and the core of the Moon are estimated. At the depths of the lower mantle, the P and S velocities range from 7.88 to 8.10 km/s and from 4.40 to 4.55 km/s, respectively. The radius of a Fe-10%S core is 340 ± 30 km. Original Russian Text © V.A. Kronrod, O.L. Kuskov, 2011, published in Fizika Zemli, 2011, No. 8, pp. 62–80.